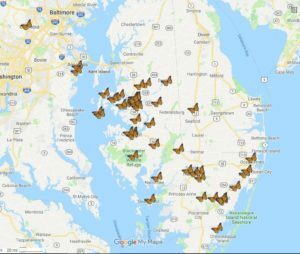 The mission of the Mid-Atlantic Monarch Initiative (MAMI) is to foster collaboration and activate conservation initiatives through shared physical and educational resources to increase Monarch habitat in the Mid-Atlantic region of the United States. A team of film-makers, runners, and pollinator advocates will be telling the story of the flight of the monarch butterfly seen through the eyes of ultra-runners who will run the same distance of 4,200 km (2,610 miles) from southern Ontario to Mexico in the fall of 2019. The Monarch Ultra is the first attempt to run across North America (Canada, United States and Mexico) in order to raise awareness of monarch butterflies who make the migratory journey every year, and whose populations are in decline. Most importantly, the Monarch Ultra is an opportunity to connect us as human beings in Canada, USA, and Mexico with common goals of Earth stewardship and biodiversity conservation. Environmental Concern is a Global Partner and our President, Suzanne Pittenger-Slear and Vice President of Restoration, Jessica Lister are both Ambassadors for Monarch Ultra. In addition to serving as an Ambassador, Jessica will also be one of the Ultra-Runners! We could not be more excited to be a part of this amazing project! Our newest MAMI initiative, Seed Stewards for Monarchs, was introduced in 2018. The goal of the program is to increase milkweed seed inventory in order to grow more milkweed. Seed Steward volunteers receive free swamp milkweed (Asclepias incarnata) or butterfly milkweed (Asclepias tuberosa) plants to start a Monarch butterfly habitat. Seed Stewards also receive a welcome bag filled with milkweed tools, tips and tags. Stewards collaborate with each other and with EC by sharing helpful hints by email, social media and in person. As the milkweed pods mature, and the seeds are ready to collect, Seed Steward volunteers exchange their seeds for more milkweed plants grown in EC’s nursery. To join the Seed Stewards for Monarchs program, please contact us. Click on one of our brochures below to learn more.